Special Operations Apps has announced a new lineup of gun accessories and iOS software that allow soldiers to use iPhones and iPads as heads-up displays, complete with nightvision, target information, infra-red, laser range finders, and video recording. 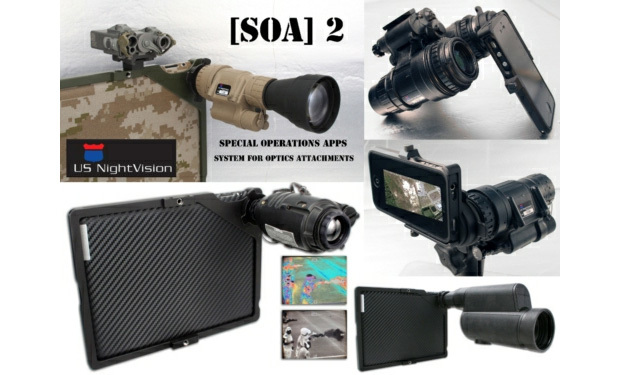 The [SOA]2 system uses scopes from another manufacturer, US NightVision. Special Operations Apps hopes to get this working on Android, the Lumia 900, and the Nokia PureView (which would be a good fit given its insane camera). Down the road, they hope to include object recognition, facial recognition, and motion tracking. We've already seen the U.S. military get pretty heavily involved in mobile, but they've been focusing primarily on the app side of things. I'd be curious to see how many other third parties start finding ways to put these devices on the field, since it seems like SOA is fairly specialized. It still seems weird to me that consumer-grade electronics can be considered secure and reliable enough for military use, but hey, if it generates cool (and likely expensive) smartphone gear like this, I'm all for it. One of the product managers, Jonathan Springer, put the relationship between soldier and smartphone in a pretty clear context. Bottom line up front, this joint teaming alliance is about integrating the best uses of technology we have right now and putting this technology into the hands of our combat soldiers downrange. The soldier already knows these mobile smart devices. It's already in his pocket, and he's already an expert at using it. Any military folks in the house? How useful does your iPhone or iPad come in your line of work?